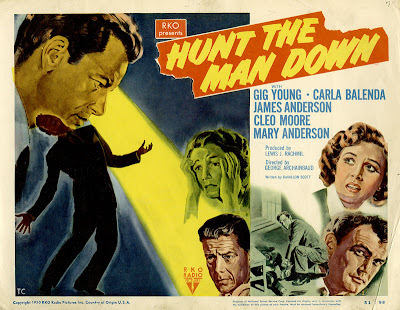 Hunt the Man Down is a snappy thriller from the RKO B-Team with Gig Young out in front of a cast of relative unknowns. A cheap, 68 minute quickie, it’s nevertheless an entertaining film that strays into the realm of film noir in unusual ways. The film opens at an anonymous L.A. watering hole — the bartender busily engaged in the closing routine, while a girl counts up the take and a dishwasher cleans up. The camera cuts through the front window where we see an shadowed figure in trench coat and fedora observing the scene. When the bartender finishes his work and cuts out, the man outside makes his move. He bursts in through the conveniently unlocked street entry, produces a large brown sack from his coat, and demands that the girl fill it with money. As she begins to comply the dishwasher enters the scene and saves the day, heroically attacking the “paper bag bandit.” The two men fall to the floor in a struggle, which ends after the dishwasher shoots the thug dead with his own pistol. In one of the more noirish underpinnings of the plot, fate exacts a price for the dishwasher’s act. It turns out the poor heroic schmuck is on the run, after lamming from his own in-progress murder trial twelve years before. He’s captured (in hell-hole Bakersfield, of all places) and remanded to custody to await retrial on the old murder charge and the likely eventuality of the big zap up San Quentin way. All those years ago, his conviction had been all but assured by the seven witnesses who claimed without a doubt that the dishwasher, Richard Kincaid (James Anderson), was the guilty party. The narrative structure of Hunt the Man Down is not uncommon. Somewhat similar to films such as 12 Angry Men, it paints a seemingly incontrovertible picture of the accused man’s guilt and then spends the lion’s share of the running time establishing, against all odds, his innocence. The man in the crusader’s role here is Gig Young as public defender Paul Bennett. My choice of 12 Angry Men as a comparison film is purposeful and a bit ironic. In that film Henry Fonda proposes a number of plausible scenarios by which his defendant may be innocent, one of which is the possible incompetence of the public defender. 12 Angry Men is the first film (at least that I’m aware of) to broach the subject of an incompetent public defender — a notion that has taken firm root over the years on the big screen and television. Think about it — in all of the TV dramas that deal with the legal profession, has there ever been an enduring series that focused on the public defender’s office? Hunt the Man Down, made seven years before 12 Angry Men, takes a much more jingoistic slant on the concept of the court appointed attorney. Gig Young’s character works as a defender because of his idealism — he doesn’t want to see an innocent man railroaded into prison simply because he can’t afford a decent private lawyer. He also boasts to Kincaid that the public defender’s office wins more cases than they lose and sport a better track record than those in private practice. Bennett comes to bond with Kincaid, and eventually believes his protestations of innocence. In order to prove his case in court Bennett is must track down the seven party-goers who previously seemed convinced that Kincaid is the murderer. An interesting notion, and one very noirish in its cynicism, is how the passage of time affects the lives of these witnesses. In relating his story of “that fateful night” to Bennett, Kincaid takes time to vividly describe each of them. The details of the story and the characters themselves here are less important than Kincaid’s 1938 impressions of them as young, beautiful, hopeful, and brimming with promise. As the story unfolds we find that all of these people have fallen on hard times, some as a result of the war and some simply through the caprices of fate. One is blind, one dead, one a drunkard, and one quite out of her mind. This rater subversive presentation of characters who for whatever reason have been unable to join the post-war utopia and are missing out on the American dream is striking in a film that on its surface is neither bleak nor overtly cynical. And while for the accused man all ends well, the lives of the seven witnesses are pushed into further disarray as a result of the trial, despite the fact that only one of them bears any responsibility for Kincaid’s dilemma. Of course the film climaxes in a final courtroom scene, where Bennett saves the day and proves Kincaid’s innocence by causing the witness who framed him all those years ago to incriminate herself. In this instance she takes the stand in full black widow array and becomes a sort of femme fatale in retrospect — she’s totally guilty, but her character is given little consideration in the narrative until the end of the picture, indeed the audience has been led to believe she’s been dead for years. Hunt the Man Down gets no big boost from its cast. Young is missing his signature loose style in the lead, and career bit-player Anderson is amateurish in his first credited role. He isn’t a detraction though, his inability to play in the same ballpark as those around him makes him feel if anything, a bit more authentic in the role of a wrongly imprisoned man. Yet if the movie has a scene-stealer it’s Harry Shannon as the one-armed ex-cop hired to help locate the witnesses. He brings a quiet confidence to his part and is at the center of one of the best scenes in the movie, a rolling gun battle through sharply filmed L.A. Exteriors. Carla Balenda is a bit over the top in the role of the key witness, but she adds a campy shrillness that keeps the film light and is worth a chuckle or two. The camera work in Hunt the Man Down is luckily by Nick Musuraca, one of the more gifted photographers of the mid century period. 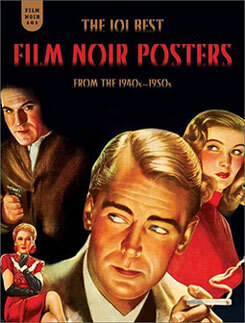 Responsible for a numerous iconic film noirs (Out of the Past, Where Danger Lives, and Roadblock), horror films (Cat People, The Seventh Victim, Ghost Ship), big-time studio pictures (The Bachelor and the Bobbysoxer, I Remember Mama, The Spiral Staircase), Musuraca brings a deft stylism to Hunt the Man Down that belies the film’s low budget. There are few excellent camera movements, though the use of shadows to enliven sets is the real strong point. Musuraca’s careful compositions combined with every variation imaginable on the venetian blind effect make the film worth watching for visuals alone. He also makes good use of L.A. locales, and the film lingers on numerous spots around the iconic city hall building. 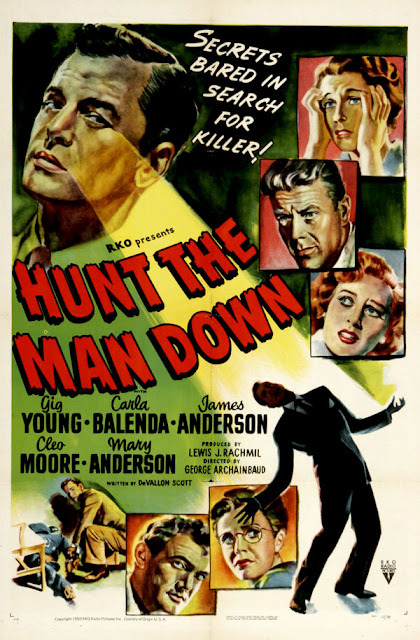 Hunt the Man Down is a crime programmer with little to speak on its behalf and likely to be forgotten quickly by most viewers. Yet I found its portrayals of postwar life to be rich in the brand of cynicism most often associated with film noir; and while lacking a legitimate noir protagonist or noirish denouement, the film remains one worth hunting down. Starring: Gig Young, James Anderson, and Cleo Moore. Welcome back, Mark, and thanks for another enticing review. 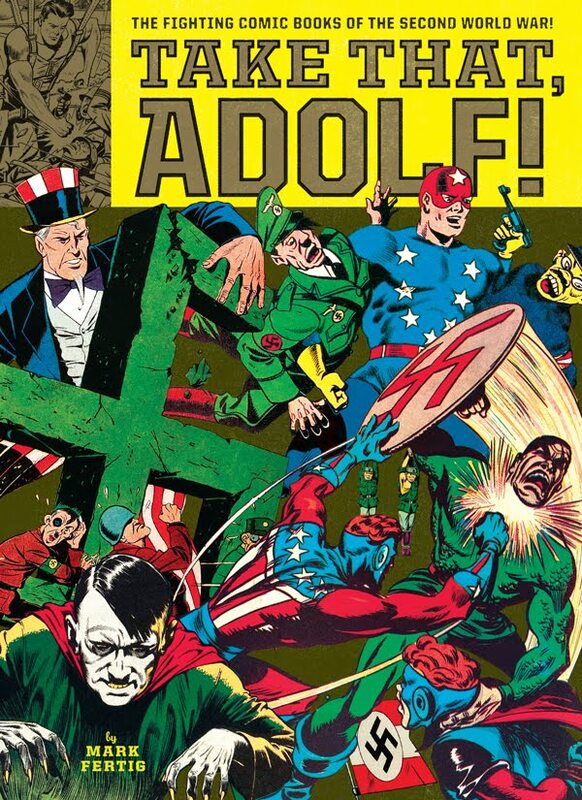 I suppose that if B movies were intended for lower-class audiences a greater emphasis on society's "losers" might be expected for audience-identification's sake, but it definitely does cut against the Hollywood grain.